Safe, reliable and transparent. A trusted source for real link building outreach. Ready To Explode Your Organic Traffic? Never has there been a more exciting time to own a brand. There is a huge opportunity for companies who understand the importance of digital marketing, who want to build exposure and reap the benefits. Our agency connects your brand with your audience to drive sales and engagement. We’re looking to work with those companies who wish to increase brand exposure and get more organic traffic to their website. We know how to do it, and we’re going to show you in this article exactly what we do to achieve this. Link building is all about high value content that talks about you in an interesting way, that people who fit your target audience would love consuming. They find it so intriguing and useful they either share it through social, on their own blogs and websites, or they click through to your website via referral traffic to become a customer. In turn, you get higher brand exposure and backlinks to your website which increase your Google ranking. This leads to more people finding your website via Google and again, more customers for you. One of the very first pieces of content we created back in 2011 was featured on Search Engine Land – one of the biggest SEO websites online. In turn this was shared on other sites like USA Today and many other internet marketing blogs. We created the content and reached out to the owner of the website. We provided value to his readers and in turn received a very powerful backlink. This is the essence of what we do when creating a link building campaign. We help you to create exceptionally high value content and then identify prospects to create relationships with. They will want to put this content on their websites for your target audience to see. Imagine a host of bloggers and influencers talking about your products/services – what would this do for your business right now? Our manual process is 100% safe with Google and cannot harm your website. If you are not doing this with an agency right now – you are missing out on a huge opportunity. Want to see our whole process in detail? Would you prefer to read the summary? So we’ve touched on why traffic and visitors are what every successful brand wants and needs. Backlinks connect real people reading your content with your brand and in turn these people visit your website. Backlinks also act like “votes” for your website that Google use for their search engine ranking algorithm. This algorithm determines where in Google search you appear. The higher up you are in Google, the more traffic you get to your website. The better the website that backlink is from, the more powerful that “vote” will be for you. The vast majority of companies who provies backlinks and SEO are going to do so in an automated way. Their process requires less effort on their part, gets inferior results and requires less accountability. The major problem with this is their random backlink process means you can get links from very spammy neighbourhoods you wouldn’t want to be associated with. The company had irrelevant backlinks from some very dodgy asian based websites. The client had nothing to do with Prada or the asian market. If we can find spam like this, a company like Google won’t have a problem doing so either. Trying to manipulate Google’s ranking algorithm is against their terms of service. Google are one of the most intelligent companies on the planet and will eventually find out. When they do, that website is toast and in the majority of cases, unrecoverable. 90% of agencies who provide link building or SEO are using something called private blog networks (PBN’s). These are massively against Google’s terms of service we mentioned earlier result in the types of spammy links you saw in the screenshot above. Often you don’t know if an SEO agency is using PBN’s, however we are transparent in the links we build and we never use those spammy practices with our clients. The risks associated with picking the wrong company can be catastrophic, incurring link penalties that can be hard to come back from, if at all. Don’t take this risk – with link building you truly get what you pay for. White hat link building requires much more effort, creativity and knowledge than black hat/PBNs. It’s harder work, requires a more personal understanding of your brand and is much more complicated to perform. Yet, it gives a much more solid groundwork to gain traffic and Google rankings to your website. You have to have a system in place that works, time and time again. Now you are starting to see the benefits of white hat link building, the remainder of this article shows you the transparency of our process to give you confidence that you are in safe hands and that no harm will come to your site from our work. We will create an email address that will be used to contact other websites and business owners on behalf of your company, usually a gmail. When contacting bloggers/influencers/websites (link targets) it’s important to create a relationship. It’s far more effective to approach link targets when you are perceived to be a part of that company. If a link target thinks we’re just a link building agency you’ve hired to build links, it becomes insincere when we reach out to them. 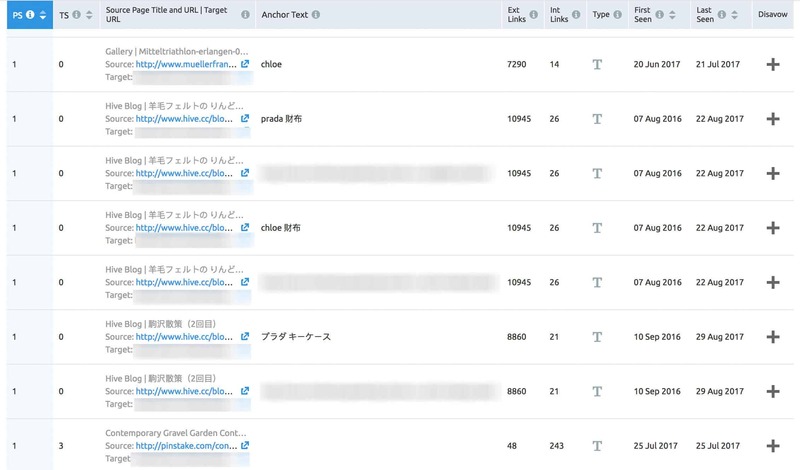 After you send us the logins for Google Analytics and Search Console, we will take a look at what traffic you are currently getting, from which keywords and look for any easy wins. Easy wins are when you are ranking outside of the top 10 for high search volume keywords but not getting any traffic. Sometimes these keywords could be pushed higher quickly so you can start getting some initial visitors. If you are position 20 for a keyword with no clicks, we could get you to the top 10 and get traffic much faster than a keyword in positon 100. Your search console data could also reveal keywords you rank top 10 for but get little traffic from. In other words, your website is getting impressions but not clicks. Changing meta data (Google description you see in results) can increase click through rates by understanding the user intent behind that keyword. Using this data gives us the most efficient path to success (we care about your ROI too). Our work is designed for longer term gains but if we can get some quick wins and a boost to organic traffic early on, we’ll do that too. We have access to some amazing tools that we use for our clients that helps us determine whether any past SEO on your website is actually working against you. We analyse your incoming links and see if any of the anchor text (clickable text in a hyperlink) used is unnatural as too many of one type can cause you problems. If a large number of your links have a disproportionate amount of 1 keyword, it can look like you’re trying to game the system. If there looks like there could be a problem or even a Google penalty, we will start building some links to spread that percentage around using anchors such as “click here” or “here”. This will help to make your link text profile much more natural. 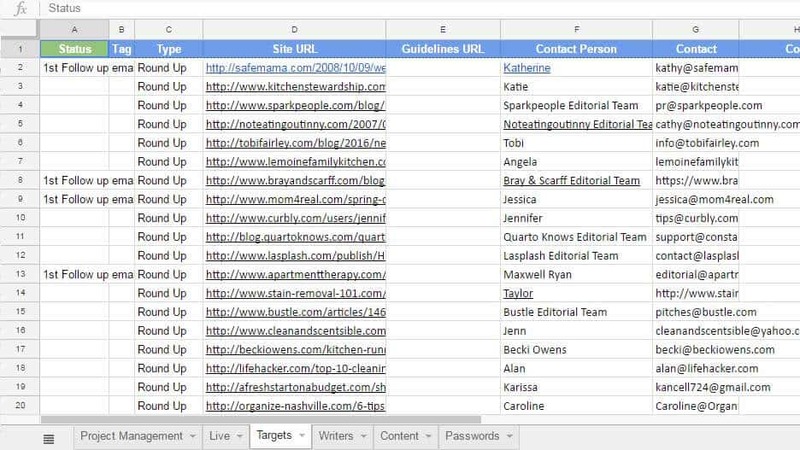 It’s important to audit where all of your links are coming from (remember the screenshot from above?). What effect have these backlinks had on your website in terms of authority and relevance for target keywords. Does the way you’ve built backlinks for specific search terms seem too obvious? If some pages are organically earning valuable links, this may indicate high quality content that could be used for future link acquisition. It may also be worth creating more or higher quality content around the subject in question that has proven to be popular. Now we need to see what content we have to outreach with, what your content creation system is like (if any) and whether people are actively reading and then sharing it. How are you sharing that yourself (if at all)? Do you or could you have a budget for creating additional content if you don’t have that in place already? All existing usable content is collated and we work with this first. Sometimes however, part of the problem is that the content isn’t great and thus is less likely to be shared, this means less links and clicks. In this scenario, better content will need to be created but with our experience, we can help you to create something that has great value and shareability. Is there someone within your organization who could create great content? We have copywriters and content creators available, so you’ll never be stuck should you not have the time to dedicate for this. The latter will be at an additional fee for their time and expertise, but we find it’s usually the best option (it has a cumulative effect as the content is shared with more and more websites and ultimately read by more and more people). We now have a better understanding of your business, your target audience and your content. There are 19 different types of links we use for our clients and understanding the former about your business will help us to determine the type of bespoke link approach we take for you. If you are happy to create or pay for content to be created, we have more options to go ahead and contact website owners with that content. We create your bespoke strategy for the next 3 months using all of the previously obtained information. You will be invited to access your project workbook that will be updated live. Inside this document there is a tab called “project management” which will detail tasks, link types, deadlines and status of each task. This will allow you to stay up to date on work to be completed. Now we conduct some technical detective work to uncover potential website partners that will be a good fit for that content. We do this with Google search operators that allow us to find the best possible candidates to “outreach” to. These people have an audience that fits your target market that we think would love your content and click through to your website. We also need to consider the owner of the website – does the content fit their narrative and would we be accepted as a contributor? We create a database of websites that would be potential targets for us to get a backlink from. There are literally hundreds of valuable search operators we use to effectively find potential partners related to your niche/audience. This is an ongoing, repeating cycle which is recorded and updated regularly in the project workbook. This means you can literally see the backlinks being made to your website in real time – unlike PBN’s which remain hidden from you. For each of the link targets collated, we send personalised emails to try and create a relationship with the writer/blogger/website. Like any business, by creating a mutually beneficial scenario, where in this case they are provided with great content for their readers, we can get ‘repeat buisness’ and may be able to regularly share content on their platform. We place the content on a relevant website, people click the link because they liked the content and are interested in what you do, this results in engaged referral traffic that turns into customers. You then get a huge boost in authority and relevance for your target keywords and rank higher in Google. Backlinks are extemely important for Google to determine where you will be placed on their search engine. Spammy links will result in penalties and you being deindexed from Google. We never create spammy links and you are 100% safe with the links we create. We create a powerful network of backlinks for your company that increase organic referral traffic and organic Google rankings. This is SEO the way it was meant to be. It’s the best type of traffic and SEO there is. This varies project to project as factors such as the amount of content and the type of links we are targeting affect this number. We’d normally aim to get around 10-15 high quality links per month that your competition would struggle to get access to. Unlike many other SEO companies who hide the work “they say” they are doing for you, we give you access to our live project workbook. This collates all the data relating to the project such as current links, potential links and content that we’ve accumulated and categorised ready for outreach. You see exactly what you’re getting for your money. Your private project workbook can be accessed at anytime, from anywhere in the world with an internet connection. We believe being transparent is mutually beneficial, we want you to know you are not paying for hot air but show you how valuable the work we do is and in return you want to stay with us for years, not months. 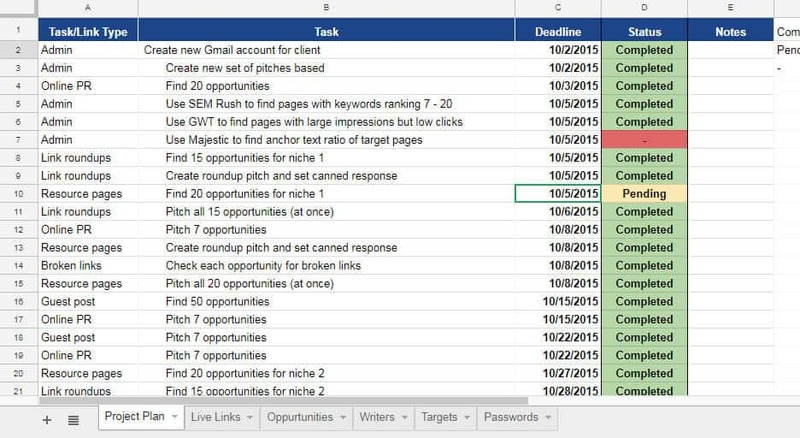 Create Gmail: We want to look like part of your team when we contact link prospects. Data Audit: We use Google Analytics and Search Console to analyse your current traffic and look for quick gains. Anchor Text Ratio Analysis: We check exisitng anchor text looks natural. Link Profiling: We check the origins of your existing links to make sure none are spammy and causing damage. Uncover Valuable Content: We see what existing content you have that is good enough to use for outreach. Tailored Link Strategy: We create a bespoke link strategy depending on your niche and type of content. Create Project Plan: We create a project workbook and set out the plan for the next 3 months. Connecting Your Brand With Your Audience: Using your content, we contact potential link targets with the aim of them sharing your content and getting a link from their website or blog. How We Communicate: Every email we send is personal. Our aim is to create relationships with the bloggers/websites we contact so we have the opportunity to share more content through them in the future. The Result: Your content is placed with high authority websites which reaches your target audience, giving your more brand exposure and boosts your Google rankings. Link Expectations: This varies project to project and also depends on the type of links we are trying to aquire. We generally aim for 10-15 high quality links per month. Transparency: We give you access to our project workbook which you can view anywhere, anytime once you have an internet connection. We want you to know you are not paying for hot air but show you how valuable the work we do is and in return you want to stay with us for years, not months. If you’re wanting to bring more traffic to your website from organic link clicks and organic search, this article is for you. All of the methods you will read below are in line with Google’s terms of service, making it white hat SEO (in case you didn’t know what “white hat” meant). Link building is an essential tool for any website owner; strong backlinks from reputable, theme relevant sources will bring real traffic to your website and can also give your site authority to get higher rankings on Google. It’s all about making your business easier to find for specific search queries. Acquiring good quality, LSI related & high authority backlinks can be done effectively in a number of ways, have a look below at how you too can give your website a significant search engine boost that can result in more leads and ultimately, new customers to form solid relationships with. Placing content on other websites can be beneficial to both parties; they get new, original content for their site and in return provide you with natural backlinks within the text. Many website owners will be open to this when the content offered is engaging, well written and relevant to their website. Sponsored posts are articles about your company or brand which are written by and placed on another site and will include a link back to you. These can be expected to come at a cost which can vary a lot depending on the authority of the site. Some site owners are more open to receiving products to review as well as or instead of payment, for example hobbyists who are not registered to make an income from their sites. A friendly, open approach to these site owners, and a willingness to be flexible can put you ahead of the competition. If it is possible to create an original, interesting and visually appealing infographic from data that only you hold, then this can appeal to other content creators who may want to write about the topic, and embed your infographic onto their site with a link back to yours. Creating surveys and consultations specifically for this purpose can be time consuming but worth it if the take up is good. Many website owners will be open to inserting new links into old, relevant content; this will usually come at a fee, however is little work for the page owner and so they may be amenable to an approach if you have the budget. If you have relevant content, submit this to them; hopefully they will agree that it is worth sharing and link to it within an article. A resource page is one where lists of relevant webpages are created. There are such lists for every type of business and niche; and your website should be listed. In a similar vein, make sure you are listed on any and all relevant business directories. Once resource pages and directories have been located then a task which is well worth undertaking is an analysis of the page, to check for broken links. Broken links are those where the resource linked to has been taken down or is no longer available. Broken links can affect the authority of a site and so it is in the web owner’s interest to remove them; however even better is if you can suggest that they instead point towards a page on your site, even if this requires creating a bespoke resource to replace the original content which has been removed. Once this piece is created, it is time well spent to see where else the broken link exists on the web, and contacting each individual site administrator to tell them about your new, up to date page. Replacing their dead link with your new content will be beneficial to both of you. If sites have previously linked to you but for some reason that link has been removed, making contact with them and asking (politely, of course) for them to reinstate the link can get you back a good natural link. If a search reveals that other sites are talking about your brand or mentioning you company but not linking directly to you, then they will often place a link in the relevant place when politely requested. A look at the links that other businesses in your sector hold can be useful; trying to recreate these links can be beneficial – or perhaps seeing where they don’t have links and targeting these sites instead. The skyscraper method involves finding content in your sector or niche which is well linked to, updating or improving upon the linked content and then letting the sites who link to it know that you have done so, suggesting to them that they replace or add the links to your content. This method involves, firstly, searching for sites that are related to yours, either based in the same locality or within the same niche (although not in direct competition). These businesses can then be approached to see if they are open to hosting a link on their website if you link back to them; this is mutually beneficial to both sites. Never underestimate the power of PR; it is amazing what traffic a cleverly targeted press release can bring to your website, bringing with it good quality backlinks. If there is something unique, or newsworthy about you or your business which may be of interest to local or national journalists, or well known digital media sites like Buzzfeed or Huff Post then don’t be shy! There will be hundreds, if not thousands, of bloggers who have sites that are relevant to your business either by being based locally, or writing about topics which are relevant to your business. Many have well established, good authority websites and if you have a valid reason for them to link to you, many will do so if it is useful to their readers, and even more will do so if offered financial compensation to do so. Universities usually host their own blogging platform which students have access to use. The majority will not go be used for very long at all, however the links hosted there are worth having; a .edu or .ac.uk address will be trusted by search engines and usually given more weight than a .co.uk or .com. Approaching students who hold these blogs is therefore another useful tactic in creating good backlinks. If you are an e-commerce company selling products via your site, then make sure you check the websites of the manufacturers; often they will have a list of distributors somewhere on their site and if not, they can usually be persuaded that it’s a good idea to direct potential customers to somewhere that they can purchase their products. Does your website create video content? If so, you are allowed to post links within the description boxes of your videos on sites like YouTube. If there is a professional organisation which governs your business sector then ensure you are a member, as you will often be rewarded with links back to your site. Events run by professional bodies will usually provide links to their speakers and sometimes their attendees on their websites, so this can make attendance worthwhile. Leaving comments on blogs and forums can be dismissed as spam if done incorrectly or haphazardly. Nonsense, or irrelevant comments and blatant link drops will usually be deleted before they’re ever seen. However, engaging in relevant conversations, and leaving pertinent links can be a good way to bring traffic as well as building links. Wikipedia is an extremely authoritative site; backlinks here are worth a lot of link juice. The beauty of Wikipedia is that it is user generated so you can submit any content you like, however spam and irrelevant links will be swiftly removed so anything you post needs to be 100% relevant. I provide the safest white hat link building available. This link building service is manual and conducted by real people, to connect with real people. Read about how we contact relevant websites with your content and get links back to you from quality websites.